People have asked me how to address intercultural diversity and Christmas-related issues with their children. I’ll start with the message of goodwill toward others and work back from there. 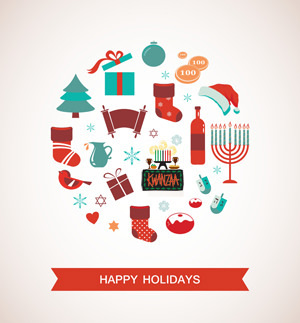 I’m Jewish, but this December I will be happy to say “Merry Christmas” to as many people as possible. Some of them may reply with a Happy Hanukah, or Sweet Kwanzaa, or whatever else anyone wants to celebrate during this Holiday Season. But everyone will do so with a smile – and that’s what this time of year is about. When people refer to a “War on Christmas,” I’m always amused. On one hand, who would ever want to declare war on such a wonderful sentiment as “good will toward men?” On the other hand, why does recognizing multiple holidays minimize the beauty of Christmas? Our country was founded on an idealistic assumption of “inclusion.” It’s not easy. Our egos and fears often get in the way. But we are a land built by (and of) immigrants and we are all the better for it. We have many different people celebrating a wide variety of winter solstice related holidays. Children are naturally curious about other people and their customs – especially at Christmas, when generosity is in the air. My uncle, who was Jewish, married a non-Jewish woman and we went to their house annually on Christmas Day. They came to our house to celebrate Hanukah. I was very young and it all seemed pretty normal to me. There was no animosity at either gathering, just food, laughs, and generosity. People explained that Christmas was about the birth of the baby Jesus, and I was happy to join the party. I love Christmas. I know the words to the carols, I’ve sung “The Messiah,” I enjoy pine, peppermint, and crackling fires. My parents didn’t celebrate Christmas in our home, but they appreciated it and allowed it to co-exist with Hanukah. As a result, my children learned the same sentiment. My mother used to say “Christmas is like a fine piece of jewelry. You can admire it, but you’ll never own it.” On Christmas day, my brilliant wife used to leave a small gift from Santa on the floor of each of our children’s rooms about which I would say, “You must have really been good this year – you’re Jewish and Santa gave you a gift! That worked for all of us. 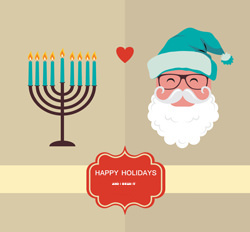 These holidays are about sensitivity and coexistence. Sometimes putting up with other people is not easy, especially when they wear different clothes, eat different foods, and celebrate different holidays. But ‘tis the season that is defined by generosity – both material and emotional – and what better time to teach our children what tolerance really means? Christmas is bigger than a coffee cup, blue office decorations, or even the words “Happy Holidays.” So let’s just remember what this season is really about, and make a point of teaching that to our children. We all know that there can be no “War on Christmas,” because love conquers all. Wishing you PEACE ON EARTH and GOODWILL TOWARD EVERYONE. This entry was posted in Uncategorized and tagged advice, Christmas, common sense, family, fatherhood, fatherly advice, gratitude, hanukah, hanukkah, happiness, holidays, intercultural, kwanzaa, love, loving family, peace, raising children, responsibility, simplification, teaching, tolerance. Bookmark the permalink.